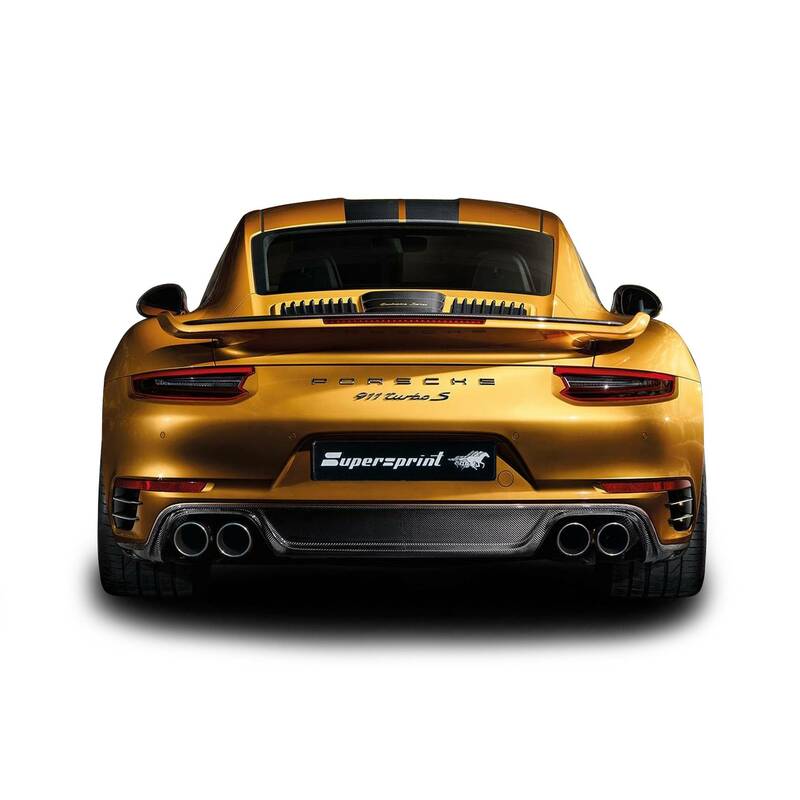 €2,244.00 + VAT €2,737.68 VAT included Rear exhaust Right - Left "Sport"
€2,693.00 + VAT €3,285.46 VAT included Rear exhaust Right - Left "Race"
Supersprint has just developed a new performance exhaust for the 2017 Porsche 911 Turbo S Exclusive Series with 607 hp. Being offered as a turbo-back system, it displaces both the extremely restrictive R&L stock catalytic and the factory muffler. 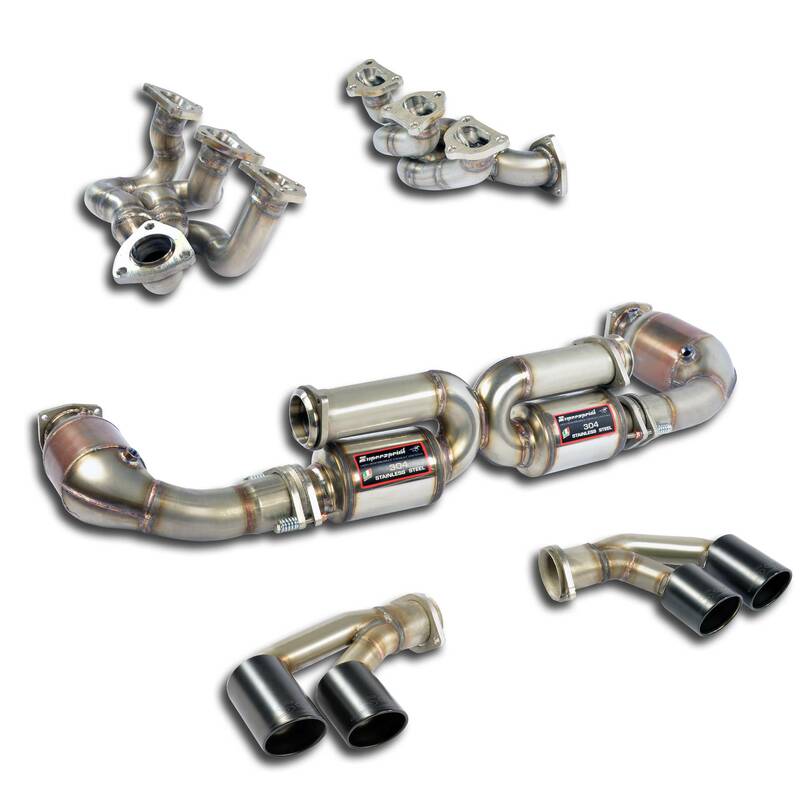 The Supersprint full system uses a set of HJS Motosport, large volume 100 cpsi metallic cats, and sports a real, straight-thru muffler with oversize piping diameter. The combined effect is a massive increase of the exhaust gas flow rate. This exhaust improves the performance on the stock engine, by a great amount, and it is designed to complement more radical performance steps, with any software upgrade up to 800+ hp, at the same time. The HJS 100 cpsi cats offer so little resistence, that their overall flow is comparable to straight, cat-deleting pipes. We are proud to testify that Supersprint invented, created and pioneered this very same design on the first watercooled 996 Turbo / GT2, some 18 years ago; then we continuously developed, upgraded and refined it with each one of later generation 911 Turbo models, from the 977.1 to the 997.2 and to the 991.1, finally to the 991.2. This Supersprint original exhaust design, in particular the key feature of the encased / exposed, built-in X-pipe, has been copied, duplicated and reproduced by very many exhaust makers, worldwide; the majority of which did not even exist, back then. While this can be considered the most sincere form of flattery, it makes us expecially proud at the same time; in fact the growth of this copycat movement is the strongest testament of how good our own, original exhaust concept really is. The Supersprint 2018 911 Turbo S system is offered to the public in two options, the Sport version, and the more radical, louder, Race version. The modular build allows for distinct looks, with our trademark, quad tip designs (round - silver or black). Mounting the Supersprint system is extremely easy, straightforward, as usual; no modification to the rear diffuser is required.